Where do Bostonians eat when we dine in local restaurants? 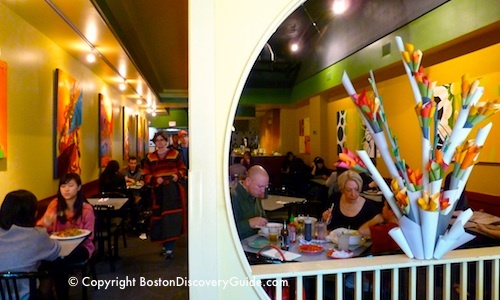 What are our favorite "hidden treasure" places for great food at affordable prices? We get these questions a lot from visitors who want to experience the "real" city by eating like a Boston Local. And to tell the truth, we wonder the same thing when we travel to other places. 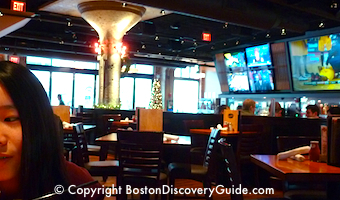 So follow us in our Eat Like a Boston Local restaurant blog to discover great places you might not find on your own - restaurants, sports bars, bistros, historic taverns, and the las test craze to sweep the city, food trucks. 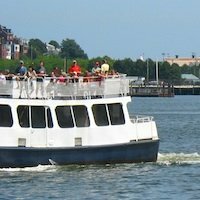 We'll tell you where to find the best local specialties - the tastiest lobster roll, New England clam chowder, and Boston Cream pie. We'll show you where to sample mouth-watering ethnic cuisine, where to grab healthy fast food, and where to find gourmet best truck food. We'll even share some of our favorite splurge restaurants. 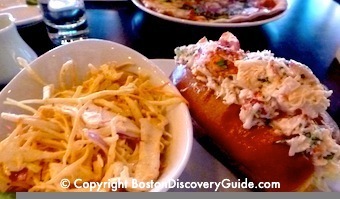 Get ready to experience Boston's food culture and savor some memorable meals. Mmm...cannoli and latte at Modern Pastry this morning - plus I managed to snag one of the half dozen or so tiny tables. Cannolis are assembled on the spot - you specify the type of shell and filling. If you're visiting Boston, be sure to visit Modern Pastry or any of the other small Italian bakeries here in the North End for a memorable treat. 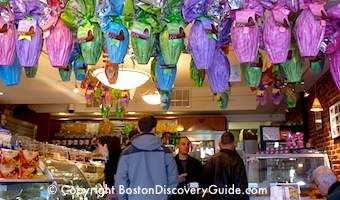 As you can see in the photo, dozens of colorfully wrapped chocolate eggs hang from the ceiling, ready to become some lucky child's Easter treat. 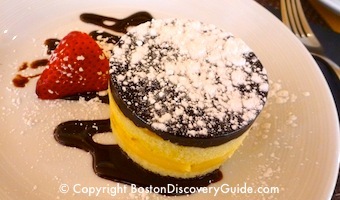 Rich chocolate ganache, layers of sponge cake, pastry cream filling, chocolate sauce, and fresh strawberry - perfection! Abby Lane has become our new favorite place for a casual meal in the Theatre District. Located next to the Shubert Theatre and across from Wang Center, it's also close to the Charles Playhouse and the Colonial Theatre. We stopped by for just bite mid-afternoon on a frigid Sunday - but after devouring a delicious nacho platter, we couldn't resist ordering a Margherita pizza and lobster roll. Both were excellent - but the accompanying coleslaw was out of this world. Normally I slightly dislike coleslaw - but at Abby Lane, it is incredibly crisp and tasty, lightly coated with a smoky, sweet, hot, and salty dressing. I considered begging the chef for the recipe. We lingered far longer than we planned, enjoying sports and Lord of the Rings on the big screens in the casual first floor dining area across from the bar. We'll be back! You'd never guess, looking at the Porter Exchange building in Cambridge's Porter Square, that tucked in the back of the building are a collection of Japanese food stalls, each specializing in a different cuisine - true "hidden gems." ChoCho's is the culinary exception - it offers mainly Korean as well as Japanese. It's our go-to place when we can't decide among the others, which is how we ended up here on this cold, snowy March day. 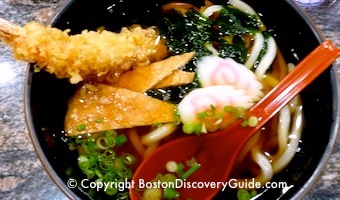 My daughter ordered this shrimp tempura udon soup - and enjoyed every bite. A cold drizzly December afternoon sent us in search of comfort food and a warm atmosphere...and so we ended up at Tony C's near Fenway Park. With burgers, a lobster roll, and plenty of games on the multiple big screensin front of us, the afternoon took on a warm glow. And we remembered why we love Boston's sports bars on non-game days. 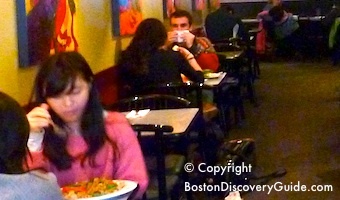 Pho and I - Best Vietnamese Food in Central Boston? Pho and I's location near Symphony Hall and Northeastern University means plenty of locals and students know about it...but it's still almost in "hidden gem" territory. You can find lots of excellent Vietnamese food in greater Boston, especially in Dorchester. But in central Boston, where you're most likely to be if you're a tourist, you'll find fewer choices. Fortunately, Pho and I is outstanding. They also offer Thai specialties, pan-Asian noodles, fried rice, Chinese-style steamed fish, and a fabulous seafood hot pot. We came right after a concert, arriving in just in time to get a table before lines formed at the door. Mango fried rice, grilled shrimp on rice, grilled lemongrass chicken - unbelievable good! We've just found a new favorite Japanese bistro at the edge of the Theatre District, just across from the Common - Fin's Sushi + Grill. All the food is freshly made, inexpensive, and delicious. Sit at one of the 10 or so dark granite tables and watch a game on the video screens, or carry out. 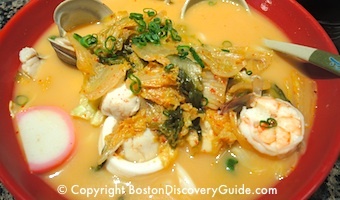 I ordered the kimchi seafood ramen shown in the photo - delicious, and for about $13, a great value as it was filled with fresh seafood - clams, shrimp, scallops, squid, and chunks of fish - in addition to the savory broth and noodles. 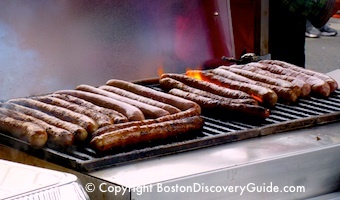 You can smell them from a couple blocks away - Fenway Franks and all their tasty cousins, sweet Italian sausage, kielbasa, and monster dogs, sizzling on grills on the sausage carts outside the stadium, in kiosks along Yawkey Way, and inside in the concession area under the Section 1 grandstand. It's a hypnotic smell, and even if you don't usually love hot dogs, you'll want one. They taste like summertime and baseball and our eternal hope for a winning Red Sox season. Wins aren't plentiful this year - but at least we have Fenway Franks for solace. To get them: Just follow the smell - they're everywhere in and around the stadium. We usually get ours from the sausage cart grills, like the one in this photo. On game days, Yawkey Way turns into a street party and you have to show your ticket to get in.